U.S. Rep. Ron DeSantis and Agriculture Commissioner Adam Putnam exchanged insults and name calling Wednesday in their final debate before Florida’s Republican primary for governor, as Putnam tried to regain momentum lost after President Donald Trump endorsed DeSantis. Putnam called DeSantis “the ‘Seinfeld’ candidate” — a reference the television show that’s supposedly about nothing and an attack on DeSantis for spending more time on Fox News than campaigning in the state. Later, DeSantis called Putnam the “errand boy for U.S. Sugar,” referring to hundreds of thousands of dollars in contributions Putnam has received from the sugar industry. That was in the first 15 minutes of the hour-long debate. It got nastier from there. Putnam tried to undercut the Trump endorsement by depicting DeSantis as out of touch with Florida issues and a candidate who hasn’t revealed a plan for running the state. Putnam was leading in polls until Trump backed DeSantis. Now polls show DeSantis ahead less than three weeks before the Aug. 28 primary, and it was clear Putnam was trying to address the Trump issue head on. Kent Justice of WJXT moderated the debate and sometimes seemed on the edge of losing control of the candidates and the audience. At one point during a commercial break, he admonished the crowd for breaking out into shouts as the candidates answered questions. The two candidates also traded blows over the environment and the recent toxic algal blooms that have hit the state’s two coasts. The U.S. Army Corps of Engineers releases polluted water from Lake Okeechobee to lower the pressure on the lake’s dike to avoid a repeat of a 1928 hurricane breach that killed 2,500 people. The discharges, however, have forced the closure of beaches and harmed tourism. DeSantis said that he supports plans to build a reservoir south of the lake to store water, but at the same time he ripped Putnam because the sugar industry has backed him with hefty campaign contributions. The industry has resisted any plans that would require using land owned by the industry to store the water. DeSantis added that he doubted reports that put part of the blame for the algal blooms on leaky septic tanks. Putnam scoffed at DeSantis’ answers and said he was ignorant about the state’s water woes: “I think you can take everything that my opponent knows about water and put it on your sticky note and still have room left over for your grocery list.” He said there was no “unicorn and rainbow pixie dust solution” and the state needs a long term strategy. Putnam castigated the federal government and said it has not lived up to past promises to fund reservoirs or help repair the dike. He also said that DeSantis did not care what happens to the small towns that rely on sugar and agriculture for their livelihoods. 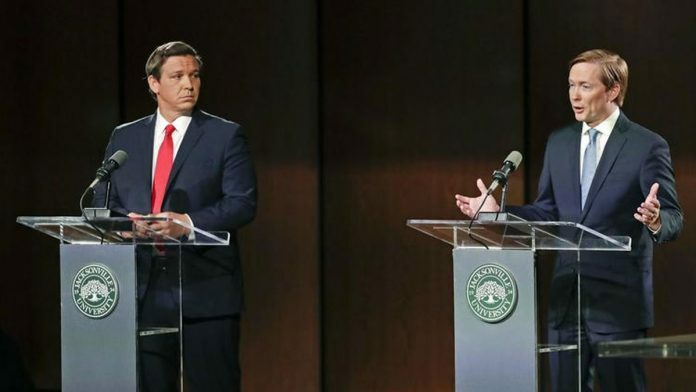 DeSantis called out Putnam for negative television ads that say DeSantis supports a 23 percent national sales tax, saying the ads are deceptive because they don’t say the so-called “fair tax” DeSantis supports would eliminate federal income tax. “If he’s willing to misrepresent something that many conservatives have supported for years — the fair tax — by spending millions of dollars in commercials and fake advertising, what makes you think as governor that he would actually level with you and tell the truth?” DeSantis said. Republican Gov. Rick Scott can’t run for re-election because of term limits and is instead challenging Democratic U.S. Senator Bill Nelson. Democrats running for Scott’s office include former U.S. Rep. Gwen Graham, former Miami Beach Mayor Philip Levine, Tallahassee Mayor Andrew Gillum, billionaire Jeff Greene and Orlando-area businessman Chris King.